10,521 people have signed. Help us reach 20,000 signatures. A date has been set for the criminal trial of Father Tony. He will face off against his government prosecutors on July 6th, 2020 (next year) in Superior Court. The reason for the delay is to give Father Tony's lawyer the time to bring forward a separate civil challenge to the constitutionality of the "access zone" law. The previous Liberal government of Kathleen Wynne had established large, city-block-sized "access zones" where our freedom of speech and assembly is removed on the public lands, streets, and sidewalks around the province's abortuaries. Father Tony's court proceedings began today in Ottawa. His lawyer, Mr. Albertos Polizogopoulos, is asserting that Father Tony's charter rights were violated - not only by the police laying this wrongful charge against him, but in the very existence of the "Safe Access to Abortion Services Act". This draconian law places undue limits on everyone's freedom of expression - particularly for those who would question the law and its purpose. According to Father Tony's lawyer, "The limits cannot be demonstrably justified in a free and democratic society." Mr. Polizogopoulos' letter to the Crown prosecutor is available here. The trial has been adjourned to January 24th and transferred to the Court of Justice (instead of the provincial offenses court), because of the constitutional challenge. The true north strong and free is fast becoming anything but. Maybe our rulers should change the lyrics of our national anthem to: "the true north tyranny". 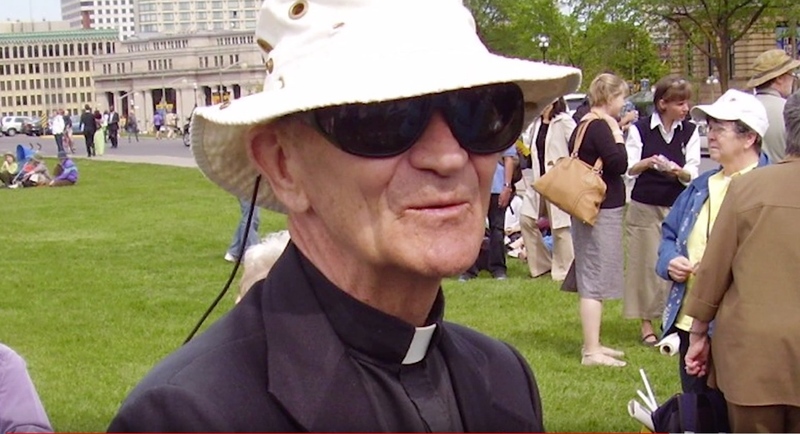 On October 24th, an 83 year old Catholic priest was charged by Ottawa police. His crime? Defending free speech. Father Tony Van Hee was quietly sitting on a stool on a public sidewalk in Ottawa carrying two signs. He was not yelling or shouting. He was not blocking the sidewalk. He was not making mean faces. He was just carrying some signs - signs that most people would agree with. The sign on his chest read: "The Primacy of Free Speech. Cornerstone of Western Civilization." The sign on his back read: "Without Free Speech the State is a Corpse." Apparently, these "dangerous" messages required armed police officers to arrive in their squad car, confront the elderly priest, confiscate his signs, and charge him with violating Section 3(1)(e)(iii) of the "Safe Access to Abortion Services Act". (iii) intimidate or attempt to intimidate the person. So the police have claimed that Father Tony was trying to intimidate women into not getting an abortion. How absurd! The "Safe Access to Abortion Services Act" was enacted by the former liberal government of Ontario under Kathleen Wynne in February of this year. Under this draconian law, all personal speech, activity, and messaging is subject to strict police control and restriction within 50 metres (and up to 150 metres) of abortion clinics and abortionists' homes. Your constitutional freedoms and human rights are suspended in these so-called "access zones". Section 3 of the Act not only restricts "intimidation", it goes much further than that. It states that "no person shall..."
(c) perform or attempt to perform an act of disapproval concerning issues related to abortion services, by any means, including oral, written or graphic means. In other words, you can not say a thing against murdering prenatal children. You can not even be perceived as saying a thing against this. And you certainly can not give women options. If you do, you will face a fine of up to $5,000 and a possible prison sentence of six months. You might be on a public street or sidewalk, but if you happen to be in an "access zone", you can be arrested by police for saying, praying, or wearing the wrong thing. (And it's up to them what that is). Though this law was passed under the pretext of “safety for women”, it is clear now that its purpose is to suppress certain viewpoints and beliefs within the province. The charges laid against Father Tony prove that this law is only there to halt political dissent and criminalize non-liberals. It is amazing that, as we see a rise in pro-choice political violence (see www.StopPoliticalViolence.ca), the response of governments and police is to clamp down on the rights of pro-life and pro-freedom Canadians. Surely this is a far cry from the founding vision of our nation - and a far cry from what thousands of Canadian soldiers gave up their lives fighting for in the great wars and conflicts of the past. In light of this, we are calling on Ontario Premier Doug Ford and his caucus to revoke the tyrannical "Safe Access to Abortion Services Act". Mr. Ford has already launched a free speech policy for college and university campuses. It is only fitting that he likewise return free speech to our public sidewalks and streets! I am writing to you about the erosion of our personal freedoms in Ontario, and I am asking your government to take action. Under the previous liberal government of Kathleen Wynne, a draconian law was passed that took away our fundamental freedoms in certain public spaces - spaces that are supposed to be open to all people of all beliefs. In the "Safe Access to Abortion Services Act", Ontarians are not only forbidden from peacefully protesting abortion, they are forbidden from saying anything at all against it. They can not express any pro-life view and belief in any way whatsoever. If I say the wrong thing or look the wrong way, I could be arrested! This is obscene. Under the guise of this Act, two peaceful senior citizens have been arrested already - not for protesting abortion, but for simply protesting the Act. Both Cyril Winter (in February) and Father Tony Van Hee (in October) were charged as criminals for carrying "free speech" signs. The "Safe Access to Abortion Services Act" does nothing to increase the safety of women procuring an abortion. Section 264 of the Criminal Code of Canada already forbids all forms of harassment. It is obvious that the purpose of this Wynne-era Act is to criminalize non-liberals and suppress pro-life and pro-freedom viewpoints. I believe this is wrong. Our freedom of expression is a fundamental right. It is a core Canadian value. It is what past generations fought and died for. I believe this freedom is open to everyone in every public space in this province. Therefore, I am calling on you to revoke this tyrannical Act and restore our freedoms.